Owning a cat as a pet is an absolute joy. In many cases, cat owners feel like they are the ones being owned, though. Therefore, cats end up being rather spoiled. 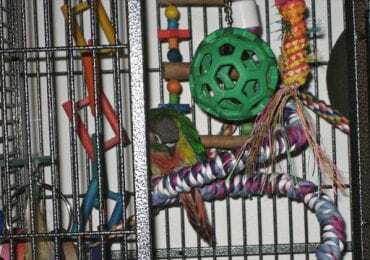 In many situations, they end up having toys beyond their needs. 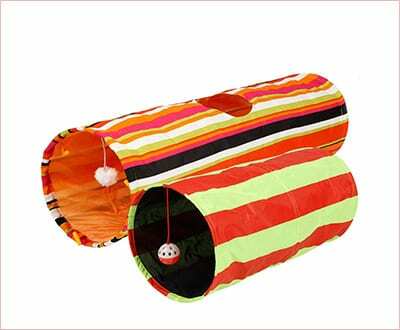 One of the most popular toys cat owners pick for their fine felines is a cat tunnel. 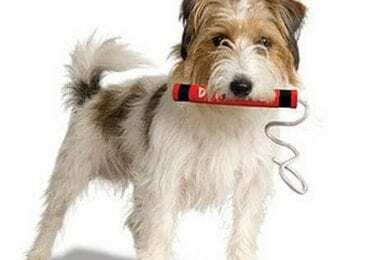 These toys promote exercise for these four-legged creatures, and there are various ones to pick from. 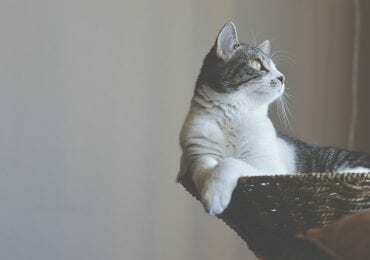 Here are the ten best cat tunnels for any cat to enjoy, based on price, quality, and value. 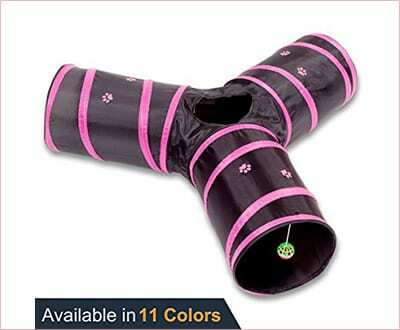 Number 10 on our list of cat tunnels is Shop4Omni’s kitty cat tunnel pet toy. One tunnel is included in the package, and it has four exit holes across the tunnel. Two of these four are at the ends of the tunnel, they measure five inches by six inches, and they are oval in shape. There are two toys that hang inside each tunnel for the cat to play with, namely fur balls on elastic ropes. The great thing about this model is how long it is. At four feet long, it is one of the longer options on the market. The tunnel has a diameter of about ten inches. This model comes in one of four colors: blue, yellow, green, and red. It is one of the longest tunnels at four feet in length. It has multiple holes for cats to play around with. 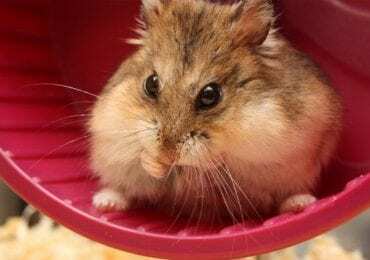 The fur balls can be replaced as they are played with over time. This model is made out of a thin material that the cat might be able to rip through. 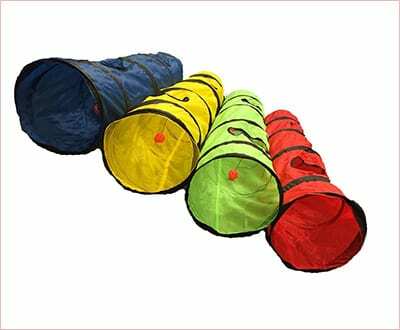 SmartyKat’s collapsible tunnel for cats is meant for cats of all sizes. It is made with a hidden crackle material that intrigues cats and engages them with the chute. This model collapses down in an instant, and it closes securely with the attached ties that are included for the sake of easy storage. It measures 35 inches long and 9.5 inches in diameter. At the same time, it can retract down to only two feet long. It has an opening in the top at one end to engage cats in playing through multiple parts of the tunnel. SmartyKat ensures all of its products are tested for child safety. This model also comes with a satisfaction guarantee. Cats can rip the crinkle material of this model rather easily. 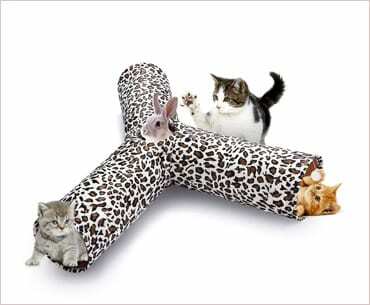 This collapsible 3-way tube for kitties from isYoung is in the same category as the previous two. This model has three tunnels that come together to form a center point. Therefore, there are three openings for cats to run in and out of. At the same time, toys can be hung from each end of the tunnel. 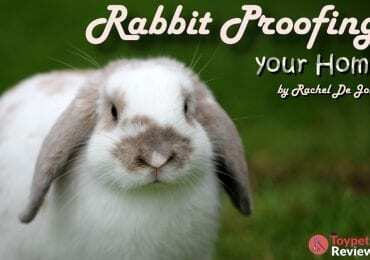 This model encourages curiosity, play, stalking, and exercise, especially when treats and toys are involved in the process. This model folds down into in seconds, so it can be taken on the go. This tunnel is not suitable for larger cats. This model is bound to be a cat’s new, favorite toy. The hide and seek tunnel from Dezi & Roo is a preferred model among cats. It models after brown paper bags that cats are known to be so fond of for playing in and out of. 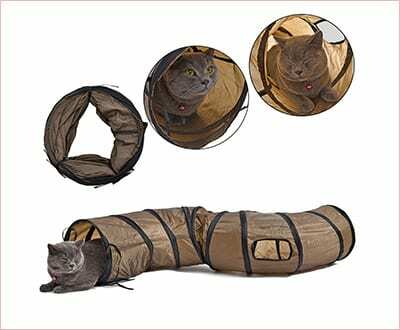 This fun tunnel combines the thrill of a tunnel with that paper bag crinkling that cats love and enjoy. Keep in mind that it is a single tunnel with openings at both ends. This model is veterinarian approved. It is handmade in the United States. The tunnel is made of eco-friendly, biodegradable material. It folds like an accordion for easy storage. This model is made out of a material similar to a paper bag, so it might rip just as easily as it is used over time. Feline Ruff’s collapsible crinkle tube is another model that has three tunnels that come together in order to form a point. This model is a bit more spacious than the previous three-way tunnel. It comes together to form a hole in the middle that has a peek hole for cats to look out of. It provides hours of self-amusement for cats in the form of a wonderful playhouse. This model has a durable and safe construction. It is made of ultra-strong polyester, which wraps around a sprung-steel frame. The tunnel can be folded and collapsed with ease. The tunnel is not very durable. 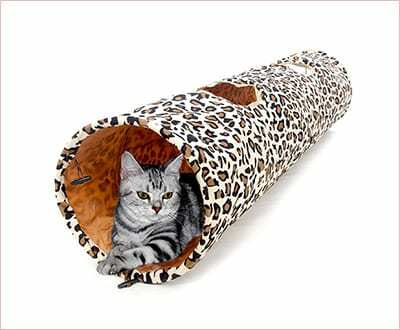 This is another popular cat tunnel by PAWZ Road. 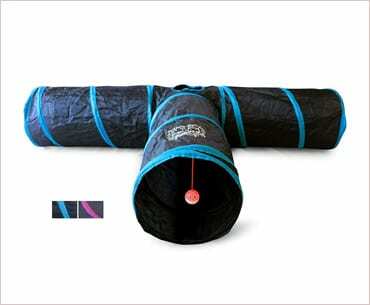 This collapsible tunnel measures 47 inches long, and it has a 9.9-inch diameter. There is also an extension on the tunnel for hiding or sleeping. This model is strong and solid in its spring structure. It is made of a steel frame that pops out and retracts with ease for portable fun and easy storage. This model promotes play and exploration. It might not be as durable as it claims to be. This tunnel model is the best option because it comes with two tunnels instead of just one. One tunnel measures 35 inches, and the second one measures 18 inches. Small and large cats will feel at home in these two tunnels. 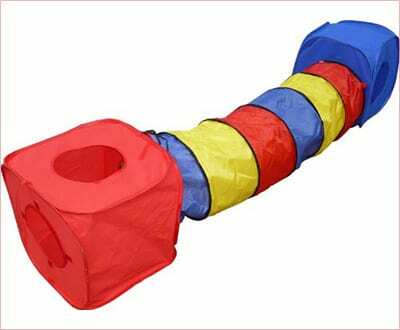 This toy is highly interactive as cats can run through the tunnels, and there are toys for them to play with at the end of each tunnel. This model also collapses for the sake of storage and portability. Unlike other models, this one is perfect for a home that has multiple cats, as it will stand up to the test of more than one cat playing with the tunnels at the same time. Here is another three-way cat tunnel with a hole in the middle of the unit where the three tunnels join together. 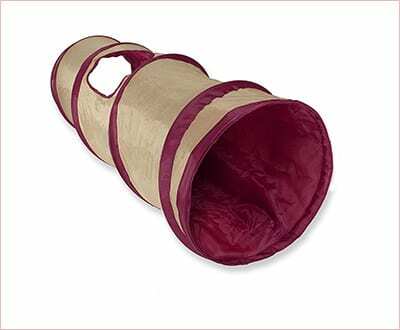 Prosper Pet’s collapsible 3-way cat play tunnel comes in many colors, so they will fit any home’s décor. This model has three tunnels for more play, and it is also suitable for more cats at any given time. It is a prime model. A 100 percent money-back guarantee for those who are unsure of their purchase. The metal wire of this tunnel can come loose from the frame, poking out of the sides. PAWZ Road’s second model on this list is one of their largest. This tunnel for fat or big cats measures 51 inches long, having a 12-inch diameter. No cat will have trouble traveling through this tunnel. There are two holes along the tunnel to promote hiding and seeking, too. Cats of all sizes are able to play with this model with ease. This tunnel retracts so you can store it away easily. It is has a faux fur cover, which is more natural on the cat’s tiny feet. Faux fur smell might keep away cats at first. 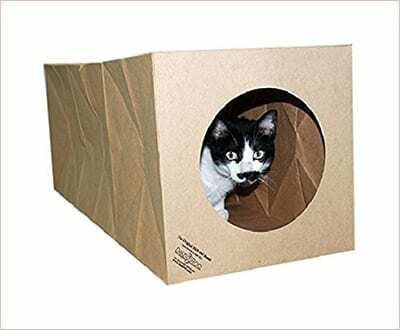 HDP’s Rainbow collapsible cube & tunnel set for cats is the perfect model for homes that are full of cats. There are two, large cubes at each end of the tunnel, which invite cats to come and play, and rest more often. Its rainbow colors make it fit for any home décor. This model measures 48 inches in length, with a 15-inch opening at one end and an 11-inch opening at the other. Thus, it is perfect for larger and older cats to move through easily. The bright colors attract cats of all ages. It can connect onto other cubes, too. The stitching seems to come apart quickly. The wires forming the cubes can bend easily. There are plenty of cat tunnel type toys out there. Only one is the winner, though, and that is the rainbow cat tunnel from HDP. It has the most options available for cats to play with. However, there are many offers to choose from, as you can see. And, if you want to get the complete package for your cat, here is our selection of the best cat chew toys. Let us know what your thoughts are in the comments section below. Or, if you have other suggestions, we’d love to know more!